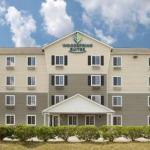 WoodSpring Suites Columbia Fort Jackson offers accommodation in Columbia South Carolina. Private parking is available on site. Each room at this motel is a flat-screen cable TV and a kitchenette with a microwave refrigerator and cook top. Certain rooms include a seating area where you can relax. A private bathroom is also included. You will find a 24-hour front desk at the property. Extras include guest laundry 24-hour vending machines and free parking. Columbia is 22 km from WoodSpring Suites Columbia Fort Jackson while Sumter is 50 km away. The property is also a 15 minutes' drive to Fort Jackson.